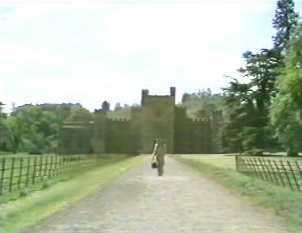 Hampton Court was the memorable location used during the second half of the first series of Survivors. 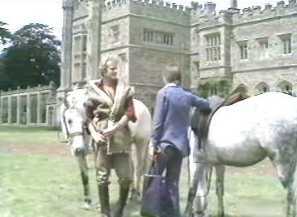 A total of seven episodes were filmed here between April and June 1975 [from Starvation to A Beginning]. This page features Hampton Court then and now, drawing together memories of cast and crew, publicity and production photos and finally information about visiting the location today. Below: Hampton Court in June 2001. We based ourselves in Monmouthshire and Herefordshire because the two counties weren't heavily overflown and a silent countryside was a necessary prerequisite for the series. Once again we had to consider the best use of our facilities. Since we had to videorecord at least twelve minutes of material a day (at a time when the output of the average filming day was around three minutes of cut film), the only way we thought we would be able to achieve this was by parking the scanner in one spot for the greater part of each episode." "Hampton Court was brought to our attention by one of the local estate agents in the summer of 1974, and in its almost derelict state it certainly held some interesting pictorial possibilities for us, with its extensive gardens and grounds. By the time we actually came to shoot there, following the deferral of the series, it had changed hands and the developers had to move in wanting to refurbish the house into a business centre. We were forced to agree a very strict schedule with the developers - 'please don't touch that bedroom until we've completed episode eight and please don't start on the kitchens until we've finished episode ten', etc.'" "The house was convenient for the actors in that there was plenty of shelter when it was cold and wet, and very pleasant lawns to lounge about on when the weather was fine. The house wasn't, of course, available to us for the second season as by 1976 the face-lift was complete and had completely changed character." 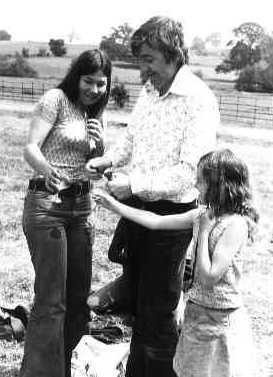 Picture 1: Pennant Roberts with Tanya Ronder [Lizzie] and a member of the production team. Pennant directed three of the seven Hampton Court episodes including: Starvation, Law and Order and A Beginning. 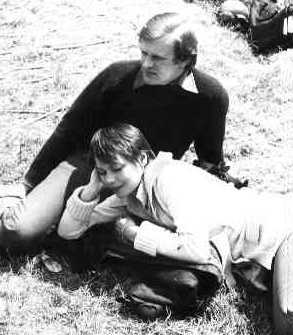 Picture 2: Ian McCulloch [Greg] and Carolyn Seymour [Abby] relax during the filming of The Future Hour. "I didn't like the place very much, no. It was very gloomy and a bit spooky. It was all right when you were outside though." Below: Lucy Fleming and Ian McCulloch relax between takes in the kitchen at Hampton Court during production of Starvation. "I enjoyed [Hampton Court] very much. It gave us a permanence. 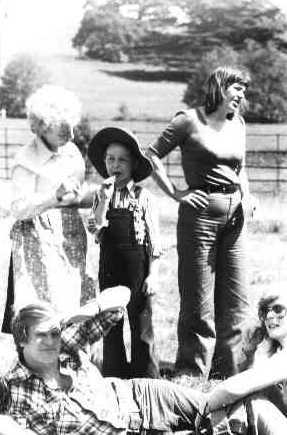 That's when the children came up and we ended up being able to have a sort of life as well as the work. We had cottages close by, I had a farmhouse that I lived in." 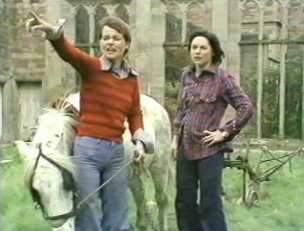 "You tell me that Lucy found Hampton Court rather spooky. I never found it spooky. It never bothered me at all. I know that it was supposed to be haunted and we had lots of rumours flying around on that and I think that a couple of people even refused to work there! But Hampton Court was fine, not only did we have somewhere to sit down, rest and get warm, but mostly because you knew where you were going to be all the time, you weren't constantly running around and I find that that's the most difficult part about location work; never knowing how you were going to find it and so on. Certainly with Survivors you had someone to drive you wherever, but I like being in one place and I don't like moving around a lot. It was a great location." 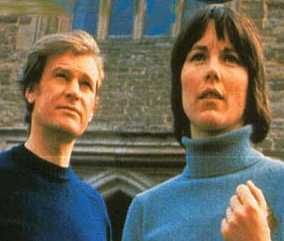 Below: BBC publicity photo of Ian and Carolyn. 1: Greg and Jenny. 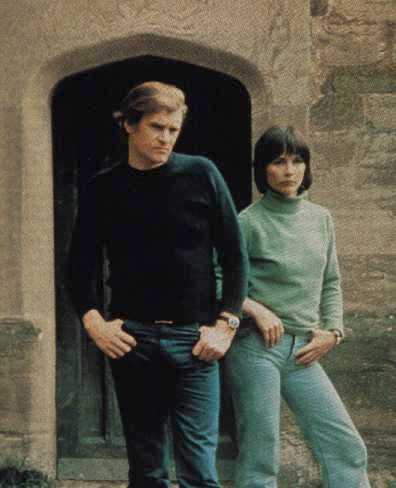 One of the many official BBC publicity photos taken during recording of Starvation, used to promote the series both in the UK and abroad. 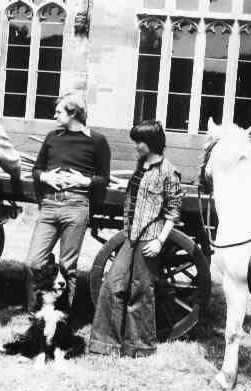 2: Jack Ronder [who wrote two 'Hampton Court episodes': Starvation and Revenge] pictured here with Anne Christie. 3: Ian McCulloch plays with Tanya Ronder in front of the castle. 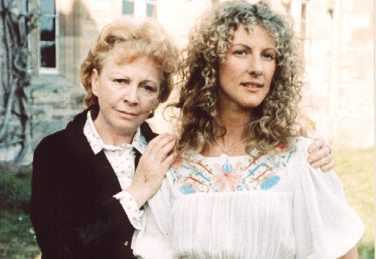 Eileen Helsby [Charmian] is also visible in the background along with the caravan from Spoil of War. 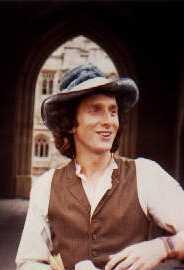 4: Christopher Tranchell [Paul] in a BBC publicity photo also taken during Spoil of War. 5. 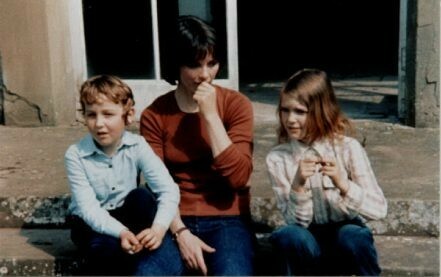 BBC photo of Emma and Wendy taken at Hampton Court. 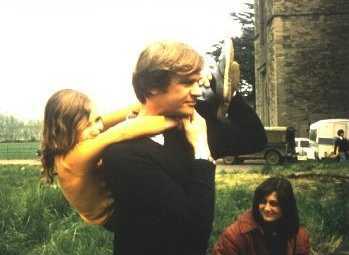 Caroline Burt [Laura] and Ian McCulloch during filming of The Future Hour. 8: Lucy Fleming, Ian McCulloch and 'Ben' during recording of Revenge. 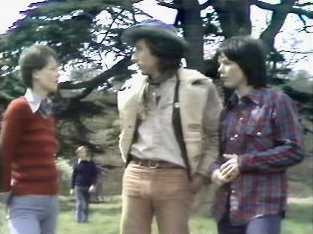 9: Lucy Fleming with Tanya Ronder [Lizzie] and Stephen Dudley [John]. 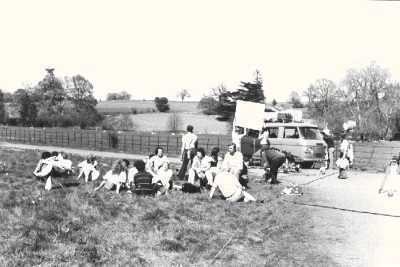 10: Filming underway, presumably during Starvation, given the presence of the Commer van and Julie Neubert sitting in the grass in her white outfit. This is most probably the close up of Carolyn when she sits in the van after having pulled up at the entrance. The Hampton Court estate is now owned by an American based charity. They have employed a skilled workforce to revive the ancient gardens; previously laid out by George London in the 17th century and then Humphrey Repton a hundred years later. There are many different types of garden on the site including a Flower Garden which has an ordered layout with ornamental water steps and canals. 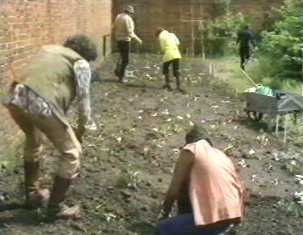 The Kitchen Garden, which produces organically grown vegetables and fruit and cut flowers, was the setting for scene in Something of Value in which Abby and co. try to salvage some crops after the flood. 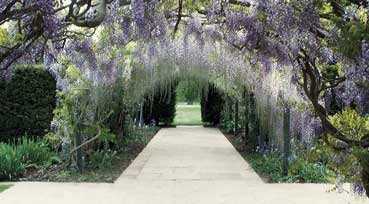 The Herbaceous Borders beyond lead to the beautiful Wisteria Arch. This arch was planted in the 19th century and is undoubtedly one of the highlights of the gardens. This can be seen 'out of season' during an early scene of Spoil of War [see below]. 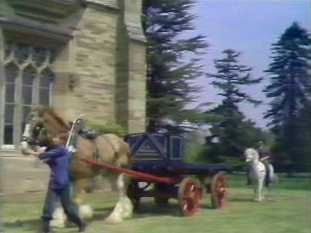 The scene towards the end of Starvation in which Tom and Barney discover some carrots and potatoes [also below] was also shot next to the Wisteria Arch. The other highlight of the gardens is the Maze with its impressive central tower, which mirrors the gothic style of the castle's towers. 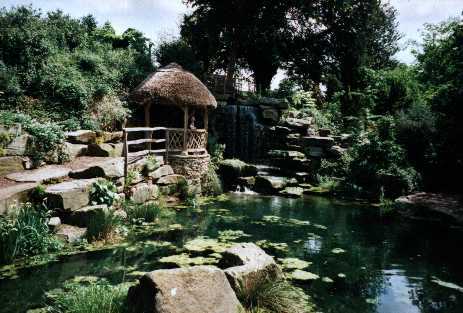 The centre of the Maze provides access to a secret passage to a luxurious Sunken Garden with a waterfall and a large pool. 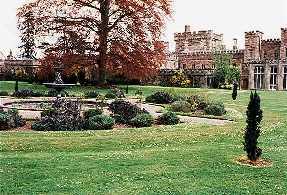 Stepping stones lead up the stream to the vast lawns that lie behind the castle, where many more Survivors scenes were filmed. 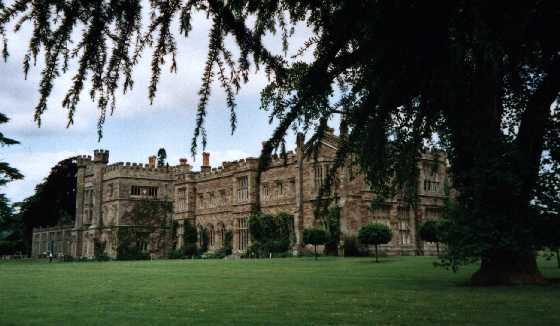 Below: The castle viewed from the back lawns in June 2001. 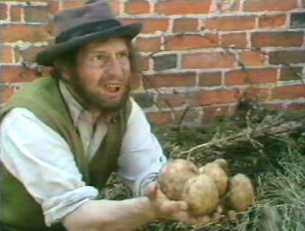 The scenes filmed at the back of the castle are too numerous to list here in full but they include: the closing scenes of Starvation, Jenny and Abby's failed attempt at ploughing, their first meeting with Paul and his subsequent tour of the grounds in Spoil of War. The harvesting party in Revenge, the sawing accident in A Beginning and of course the final scene of the first series, in which Abby returns and hears news of Peter from Jenny [all below]. 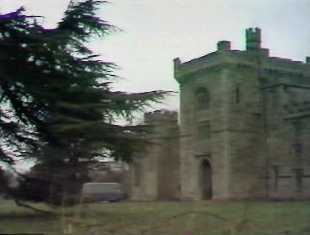 The corner of the castle, which was derelict when Survivors was filmed, is known as the Orangery [pictured on the left above]. This is now a restaurant, from which a very reasonable cream tea can be purchased. The unmissably large tree beyond the other back corner is where Greg utters the classic "I think we're home" line to Abby at the end of Starvation. One feature of the gardens which is no longer present is the ornamental fountain, at which Abby and Greg talk at the start of Law and Order. The photo below right was taken in 1994 by Bob Meade before the fountain was removed from the lawn. A River Walk can be enjoyed at the perimeter of the grounds. This takes you past the place where Abby and Jenny discuss the latter's pregnancy in A Beginning. 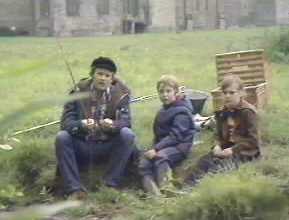 If you follow the path further along the river so you can see the front of the castle, you will notice the large pond between the river and the castle, at which Greg showed John and Lizzie how to fish at the start of Something of Value, before they were approached by Jim Buckmaster. The only part of the castle which visitors can enter is the Orangery, the rest is unfortunately 'out of bounds'. The impressive drive leading up to the castle is also private, but this won't stop you getting a good photograph of it from the impressive entrance gateway, which is also a new addition to the estate. A flag does fly atop the castle but as yet not a 'GP' one. 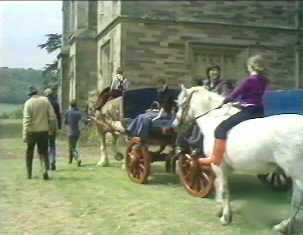 Below left: Abby, Wendy and Emma arrive at 'the Grange' in Starvation. 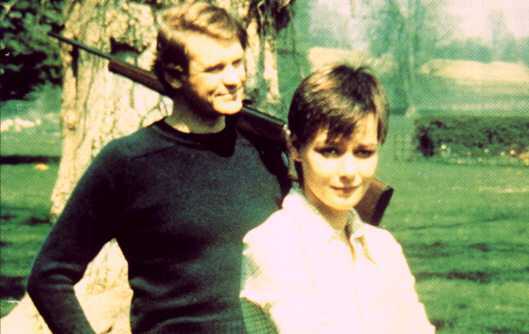 Below right: Anne Tranter leaves 'the Grange' in Revenge. 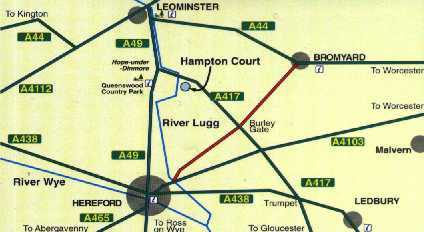 Hampton Court is situated on the A417 near Hope-under-Dinmore between Leominster and Hereford. Hampton Court can be visited from 13th April to 28th October 2002 on every day of the week except Mondays and Tuesdays, but including Bank Holidays. Charges are as follows: Adults - £4.00, Children - £2.00, Senior Citizens - £3.50, Family Ticket - £10.00. 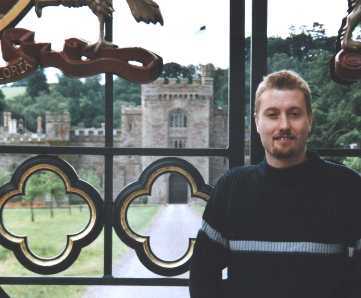 Above: Yours truly at the entrance gates last June.